One of the earliest immigrant groups to settle in Middleborough was the Chinese, who first arrived in the community during the mid-1880s. The town’s first Chinese residents were exclusively male and found occupation operating a number of hand laundries in the center of town, providing themselves with the opportunity for economic advancement. This item, undoubtedly taken from the Middleboro News, reflected the community’s insularity at the time, as well as its bewilderment, and is indicative of both the curiosity and prejudice which the alien Chinese would face. Only in the previous three decades had Middleborough begun experiencing any large-scale influx of immigrants, with most coming from northern European nations such as Ireland and Germany. The appearance, therefore, of an educated Asian lecturer with a queue (symbolizing his fidelity to the Manchu emperors), was not surprisingly cause for wonderment. Eventually, a number of Chinese would locate permanently in Middleborough, engaging in the laundry business, one of the few occupations open to them. Laundering was a menial task formerly conducted by earlier immigrant groups, and was a chore which had previously and most frequently been associated with the Irish. In 1872, the Middleboro Gazette lamented that “our town is much in need of a laundry; people can send their clothing to Boston and get it washed and ironed cheaper than they can get it done in town. We hear of fearful prices being charged for work in that line.” Anglo-Americans looked down upon laundering as a menial task and while Irish women initially supplied the need for launderers in the 1870s and early 1880s, that task would later devolve upon Chinese men. Operating a hand laundry was a business which required only small capital, no skills and little English. Chinese men, excluded from most other occupations, therefore naturally saw laundering as a means of economic and social advancement. The first Chinese laundry in America is believed to have been established in San Francisco in 1851 by a Chinese immigrant named Wah Lee. Despite the later stereotypical associations of early immigrant Chinese with laundries, the laundries did provide the Chinese with the opportunity to own and operate their own businesses, to engage somewhat more fully in the economic life of the community, albeit on a small scale, and to have hope for a better future beyond the heat, steam, toil and drudgery of the laundry. borough appeared in the mid-1880s. As early as 1882, it was reported that an unnamed Chinese man was looking to establish a laundry in town, though whether he did so or not is unclear. 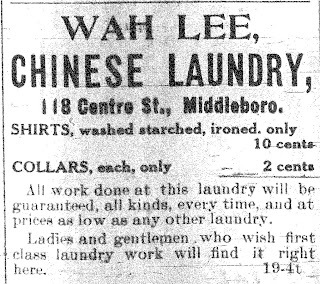 Certainly by late February, 1886, a Chinese laundry was in operation in Middleborough, conducted by Ye Check and Ye Lao, whose business was described in the local newspaper as “promising”. At the time, the two men were reported as “having handled one thousand pieces in two weeks.” Two months later, another Chinese laundryman by the name of Ye Dan was noted, although he may have been associated with the other two previously mentioned. 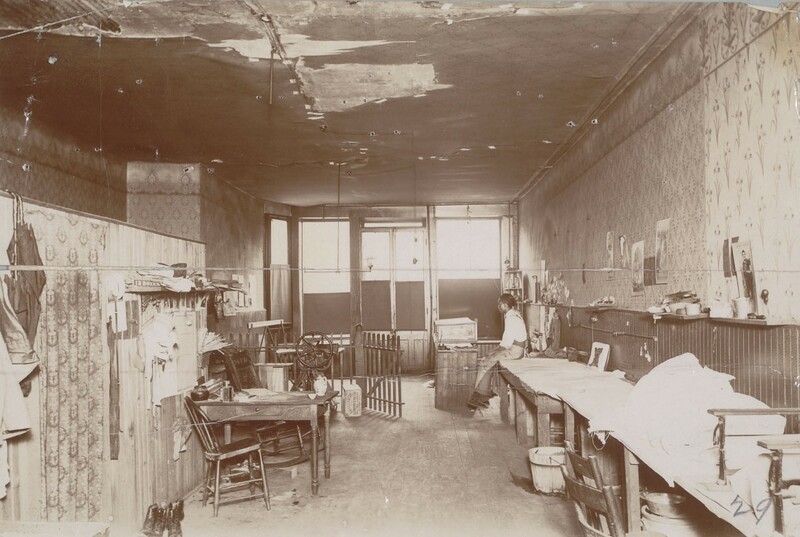 The location of this first Chinese laundry is unknown, though it was likely in the basement of the American Building on South Main Street near Four Corners where a Chinese laundry was in operation by 1891. Lending credence to this supposition is the fact that when Michael Toole’s clothing shop on the corner of Wareham and Main Streets caught fire in mid-September 1888, it was “some Chinamen who run a laundry near by … [who] gave the alarm”. In 1892, the Central Congregational Church rented its former chapel building on South Main Street to “some Chinamen, who will open a laundry there”, prompting the local newspaper to remark, “Who said ‘cleanliness is next to godliness?’” If indeed this laundry was established, it was short-lived for there is no record of it and the chapel was being occupied by an undertaking establishment by 1896. In early 1895, two additional Chinese immigrants were reported as having established a laundry, though again the details are not specified. During this time, Chinese hand laundries competed with non-Chinese laundries, many of them increasingly mechanized. In Middleborough, Stegmaier Brothers operated a laundry on Clifford Street in the late 1890s, to be succeeded by the Middleboro Steam Laundry which would be established on Center Street near Pearl Street. In addition, apparel retailers frequently acted as laundry agents, not actually performing the work themselves, but sending it out to be done. Both men’s clothiers Sparrow Brothers, and shoe dealer D. B. Monroe acted in such a capacity around the turn of the last century, catering to Middleborough residents. It has been estimated that one in four Chinese men at the turn of the century was engaged in the laundry trade. In Middleborough, the proportion was considerably higher. In fact, it appears that 100% of the Chinese population was engaged as hand launderers. The local Chinese community as elsewhere was exclusively male through the early 1900s and was composed of both single men and married men whose wives were forced to stay behind in China because of restrictive American immigration policies. Many of these men sought only to make enough money in order to return to China and lead what they hoped would be a better life. Consequently, the local community was largely transitory with only a few Chinese such as Wah Lee and Low Hen staying for an extended period of time and making their home in Middleborough. borough’s Chinese laundrymen was Wah Lee who operated a laundry in the Cushing Block (today occupied by the Central Café) on Center Street near Oak Street and who fatefully shared the name of the progenitor of American Chinese laundries. 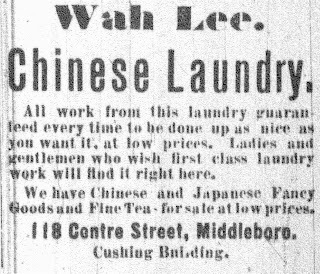 Lee’s laundry was established probably about February, 1895, at which time the Middleboro Gazette reported that two additional Chinamen had “embarked in the laundry business during the past week”. (The other was possibly Lee Toy who assumed ownership of the Four Corners laundry at about this time). Wah Lee’s laundry occupied the southernmost of the two stores (closest to the Four Corners) in the Cushing Block, and it appears to have been known as the Christian Hill Laundry, sharing the building over the years with a number of other tenants including Anders Martenson’s tailor shop. Because the operation of a hand laundry was a relatively simple affair, despite the grueling nature of the work, it could be left in the hands of others, a circumstance which allowed Lee and other Chinese laundrymen to periodically return to China. In 1900, Lee was assisted by a 36-year-old bachelor, Tung Tay, and Lee Hong, a 38-year-old married man whose wife, like his boss’ was probably in China. All three appear to have lived at the laundry. Besides laundering, Lee’s operation offered Chinese and Japanese fancy goods, as well as Chinese teas and fireworks. Lee appears to have relocated his operation to North Main Street in the 1920s. A 1929 news item describes him as being located there (possibly in the premises vacated by George Leong) conducting business with a washing machine, electric laundry stove, three electric flat irons and, unsurprisingly, a fan. Lee seems to have concluded his long career as a laundryman in the early 1930s at which time he would have been in his seventies. The Middleborough business directory for 1934 lists the laundry location on North Main Street as vacant, indicating that Lee’s business had closed by that time. By 1895, the American Building laundry at the Four Corners which probably dated from the mid-1880s was under the ownership of Lee Toy, and it is listed in directories of the era as Lee Toy Co.
Lee Toy appears to have been succeeded by laundryman Cring Chin by 1900. The federal census record of that year is not clear concerning Chin, though it records him as arriving in the United States in 1892, and being married for 15 years. Like Wah Lee’s wife, Chin’s was also absent, again most likely having had to remain in China. Chin at the time resided in a rooming house at 2 Wareham Street with a number of other American families, the location being just across Wareham Street from the laundry in the basement of the American Building. Sometime about April 1901, the Four Corners laundry appears to have become defunct, closing up shop, and being replaced by a fish market. Yet another long standing Chinese laundry operation was conducted on Academy Green, what is today known as Thatcher’s Row, facing Peirce Academy. The laundry appears to have been first operated by a man recorded variously as Soo Wok and Wah Soo. The building which housed the laundry and now numbered 2 Thatcher’s Row was built in 1895 on the northern end of the Thatcher greenhouses and initially housed a tobacconist’s shop. Shortly thereafter, but certainly by 1899, it was occupied by Soo Wok who opened a Chinese laundry. Low appears to have been succeeded successively by Ham Tom who is noted in 1908 as the laundryman on Thatcher’s Row, and later by Yin Yin, recorded as the owner in 1910. Yin, like several other Middleborough Chinese laundrymen was married. Having emigrated in 1892 he likely was forced to leave his wife behind in China. Whether Low ever actually sold the laundry and left Middleborough is not clear, for he reappears on the scene in 1914, being listed in the Middleboro business directory for that year, and again in mid-1915 at which time the Gazette reported that he was having an establishment built for laundry purposes on Pearl Street and was proposing moving his operation there from Thatcher’s Row. Whatever his ultimate destination, Low did vacate the laundry building on Thatcher’s Row which was subsequently occupied by the Middleborough Water Department in the summer of 1915. A short-lived Chinese laundry operated near the corner of Center and Pearl Streets around 1900. The 1900 census lists 26-year-old Kee Hop as a laundryman residing at the location of the laundry. He is probably identical with Sam Kee who is listed in the Middleborough business directory as the proprietor of a laundry at the same location the following year. Kee, born in China in 1873, was a naturalized citizen, having emigrated in 1887. This laundry occupied one of a row of three small stores which were located in an addition constructed on the front of the brick steam laundry building which had been built about 1897. 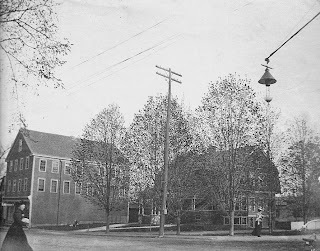 The steam laundry which had been located earlier on Clifford Street and was known as the Middleboro Steam Laundry was operated on Center Street by Clark & Keith and later by Capen & Dunham. The steam laundry building (long since demolished) was conspicuous for its 80-foot chimney. The Chinese laundry may initially have been run independently by Kee, though it may also have had some business connection with the steam laundry. By March, 1906, however, the Chinese laundry premises were absorbed into the operation of the Union Steam Laundry which had succeeded the Middleboro Steam Laundry, and the Chinese laundry forced to remove elsewhere. Kee relocated his operation to Wareham Street near the Four Corners where he is listed as being in operation in 1906. 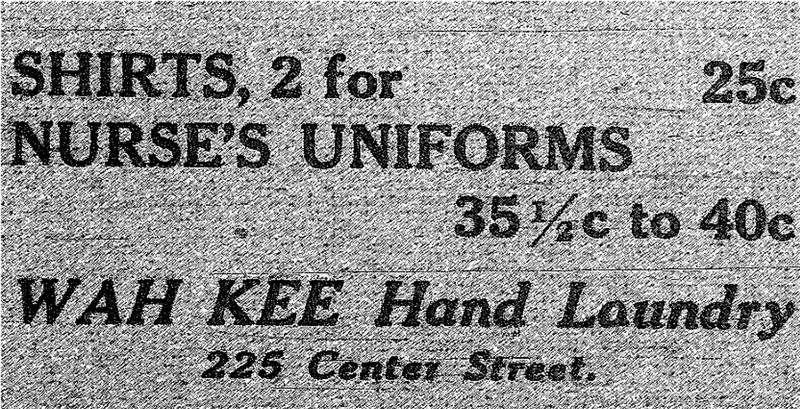 By 1909, Kee was no longer in business. In the perception of the non-Chinese residents of Middleborough, the Chinese, like other immigrant groups before them, alternated between being objects of fun and genuinely respected members of the community if we can judge by the contents of the local Middleborough newspapers. Frequently, what we today would consider among the most derogatory of racial epithets was used to describe the Chinese, though these seem to have been used with no overt malicious intent. Instead, use of terminology such as “Celestials”, “Mongolians”, “Asiatics” and much worse reflected the non-Asian community’s perception of what was permissible at the time, though it nevertheless reinforced negative racial stereotypes and impeded assimilation of the Chinese within the community. Many Chinese were hampered by their lack of proficiency in English, and the resulting Pidgin English to which they were forced to resort became an object of ridicule. In its edition of May 16, 1913, the Middleboro Gazette noted a sign hung in the window of a local Chinese laundry adjoining a cobbler shop which allegedly read: “People bring shoe come fix different doorway. Admit you, want see him go side door.” Sadly, while this item was published with no other purpose than to elicit laughter from local readers, it is indicative of the struggles Chinese immigrants had in being able to communicate and being understood in a largely alien world, as well as being treated with respect. Some Chinese did acquire proficiency in the language, however, though census records in some cases may be suspect. Wah Lee and his lodgers-employees Tung Tay and Lee Hong, as well as Hop Kee, were all listed as able to read, write and speak English in 1900, as was Joe Yap in 1910. During the court proceedings against Yap, however, in 1901, a Boston merchant had to be sent for to act as interpreter, although this may simply indicate that Yap at the time was either not fully comfortable with English or had learned the language later. While poking fun of Chinese immigrants for the lack of fluency in English was regarded at the time as harmless, taken more seriously were the two recorded incidences of physical harassment to which the local Chinese were subjected. Both involved the operator of the Academy Green laundry. In September, 1908, Ham Tom, the operator of the laundry, was subjected to the taunting of several young boys who began bothering the laundryman. “The boys were fooling when [Ham’s] sense of humor became exhausted, and he is said to have tried to polish one fellow with a flatiron.” Ham chased the boys, capturing one, Fritz Kraus, who was rescued by his compatriots. “The police investigated the affair, but no action was taken.” Six years later, the operator of the same laundry became “the object of malicious attack by youths of late.” The screen door at the laundry was kicked in and the Chinese laundryman doused with water. In the wake of the attack, the Gazette reported that “the police are looking into the matter with court proceedings to follow unless these attacks cease.” The harassment appears to have stopped following the publication of the news item. While these two incidences reflected random and fortunately rare harassment of Chinese aliens in an otherwise tolerant community, official anti-Chinese discrimination was institutionalized in the Page Act of 1875, the Chinese Exclusion Act of 1882, and subsequent laws which placed severe restrictions upon the emigration, residence and naturalization of Chinese in America. Senator George Frisbie Hoar of Massachusetts lambasted the Exclusion Act as “nothing less than the legalization of racial discrimination.” Few Chinese escaped the pervasiveness of these laws, including a Middleborough Chinese laundryman known alternatively as Joe Yap and Joe Wong who would experience the consequences of this discrimination first hand in 1901. The case, in fact, wasn’t dropped. Shay who was listed in various news accounts of the period as ranging in age from 11 to 13 and who was rather callously termed “a star actor in an embezzlement matter”, was placed under the guardianship of Superintendent Nickerson of the Middleborough Poor Farm. At his trial, Shay stated that he wished to remain at the Town Farm, and that he had been mistreated by Yap. Yap “said he did not make him work. He considered he was getting schooling enough, as he went half the time. He did not want to have him sent back to China.” The court ordered that Shay be turned over to a "state charitable institution", Tewksbury State Hospital. Despite the fact that the two may have acted without regard for the law, the tale indicates the harshness of the punishment meted out to Chinese immigrants at the time as well as the stringent restrictions designed to limit Chinese immigration into the country. Yap’s alleged perjury can today be better understood as a likely attempt to circumvent what was a racist and discriminatory law, the impact of which frequently has been overlooked relative to East Coast Chinese immigrants. It is not recorded what punishment, if any, Yap was given in 1901. He remained in Middleborough through at least 1910 at which time he is listed as a laundryman living on Center Street along with another 12-year-old nephew, Joe Wah, and a 21-year-old “cousin”, Look Lee, both of whom were engaged in the laundry with Yap. While Look Lee is listed in the census record as “cousin” to Yap, he may in fact have been Yap’s business partner, the term “cousin” being in frequent use by the Chinese to connote this type of business relationship. Included in the family in 1920 was a 13-year-old boy, Ee Wah, who is listed as the nephew of Wong You. The boy is probably the same as E. Wah Lee whom Lyman Butler long afterwards recalled in one of his columns in the Middleboro Gazette in 1968. Butler believed Lee to be the son of Wah Lee. The longevity of both the Center Street and Thatcher’s Row Chinese laundries indicates the continuing demand for such services. 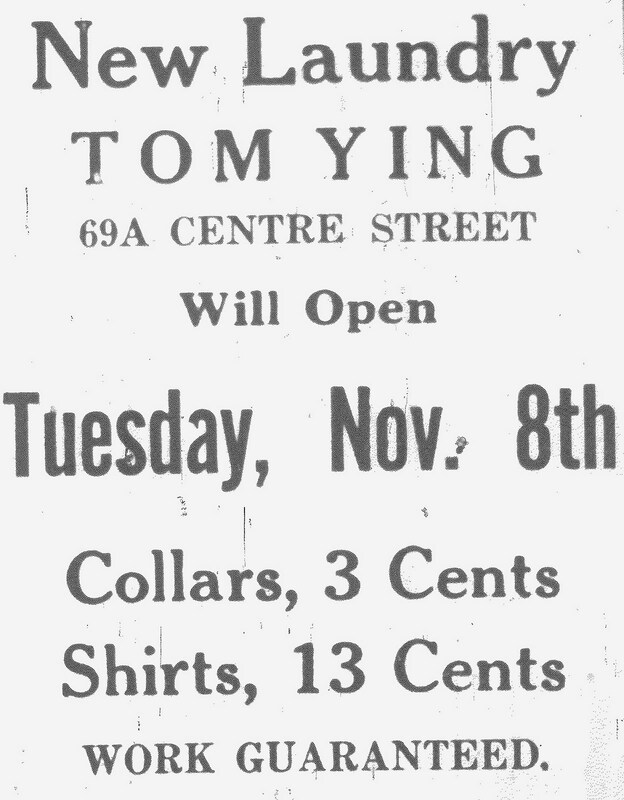 Business, in fact, for Chinese hand launderers remained brisk enough to warrant the opening of another laundry in 1921 by Tom Ying at 69A Center Street. As non-Chinese laundries like the Union Steam Laundry and the Middleboro Laundry increasingly became mechanized, Chinese laundries where work was done by hand either succumbed to competition, or survived by advertising the “hand” nature of their work, hand laundering presumably connoting a higher quality of work. 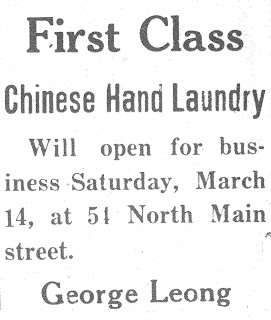 Indicative of this trend, on March 14, 1925, George Leong of Boston opened a “first class Chinese hand laundry” on North Main Street. The Middleborough directory of 1928-29 made a distinction in the business listings between “laundries” and “laundries (Chinese)”, which hinted at the mechanized nature of the first and the hand nature of the second. Not all welcomed yet another Chinese laundry in town, though it was surprisingly members of the small Chinese community which objected, looking unfavorably upon the competition offered by their countrymen. Competition between local Chinese launderers was nothing new. In 1903, when there were three Chinese laundries in town (Wah Lee, Low Hen and Sam Kee), the local newspaper made note of a “rate war” between them. “Prices have gone down to six cents. Now is the time to have your shirt washed”, urged the Gazette. All three survived this rate war, though Kee closed his doors a number of years later. Competition between the laundries in 1925 took a more violent turn. Just one month after opening, Leong’s operation was targeted by Yee Jung Let, who was associated with Lee’s laundry which objected to Leong’s competition. Since the opening of another laundry on North Main street a short time ago by George Leong of Boston there has been “something brewing” in laundry circles. It is alleged that members of the Center street laundry have been jealous of another laundry coming to town and have been giving the Leong establishment the “once over,” trying to “get” a line on how much business the latter has been doing, and have been bothering the Leong outfit in the rear of his establishment both day and night at various times. In April, Yee was arrested and charged with disturbing the peace. While the Gazette rather melodramatically speculated that the incident was the possible start of a tong war, it was more likely an incidence of an improper (and illegal) response to unwanted competition. Nonetheless, it does appear to have convinced potential competitors not to open operations in Middleborough since Lee’s laundry seems to have been the sole Chinese laundry operating in Middleborough through the remainder of its existence. Only after Wah Lee retired from hand laundering did other Chinese laundries appear upon the scene. 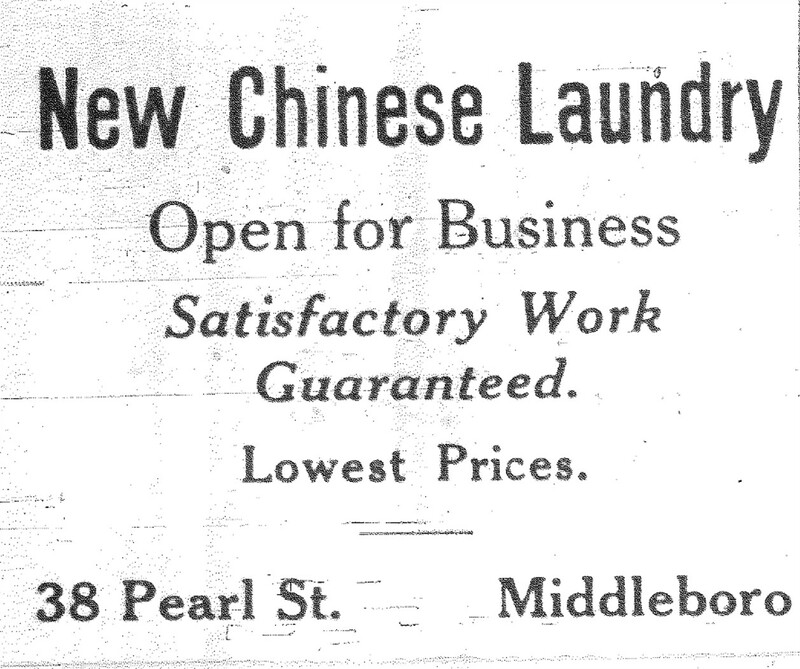 In 1933, the Middleboro Gazette published an advertisement announcing the opening of a new Chinese laundry at 33 Pearl Street, while in 1937, the Wah Kee laundry was opened at 225 Center Street. Eventually, Middleborough’s Chinese laundrymen either retired or moved into other spheres of business and the business of laundering was no longer restricted nearly exclusively to the Chinese. In 1937, Park J. Huie became what was probably Middleborough’s first Chinese owner of a business other than a laundry, opening the Nan Tung American and Chinese Restaurant in the Pasztor & Klar Building on Center Street. Fortunately, the decline in the number of Chinese laundries in Middleborough signaled a broader range of opportunities for the community’s Chinese immigrants who increasingly were no longer limited in their choice of occupation. In September, 1942, Middleborough’s last Chinese laundry, operated by James Gee closed. Gee relocated to South Portland, Maine, to take part in the war effort, engaging in shipbuilding work. 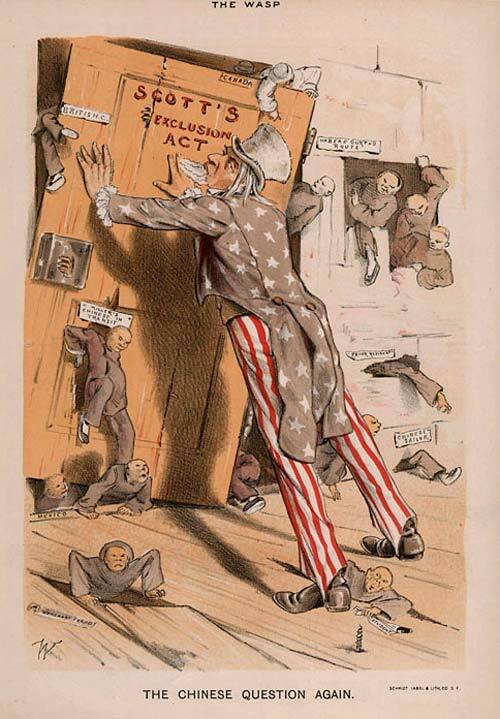 A year later, the notorious Chinese Exclusion Act was repealed. 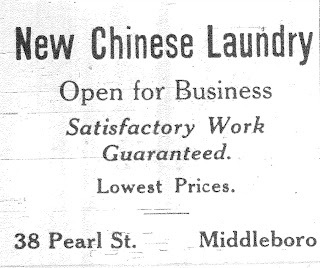 "New Chinese Laundry", advertisement, Middleboro Gazette, June 23, 1933, p. 8. Throughout the 1920s and 1930s, local Chinese laundrymen advertised the hand nature of their work, their advertisements connoting that higher quality work could be had than at mechanized laundries. In truth, residents saw little difference, one factor which contributed to the decline of Chinese laundries locally. The photograph depicts the shabby appearance of the interior of a Chinese laundry. Given that many Chinese laundrymen had little capital with which to start a business, many fixtures within the laundry were improvised. While the photograph captures how many such laundries undoubtedly appeared, it is likely that Middleborough's Chinese laundries were better kept, though still confined to similarly cramped spaces. 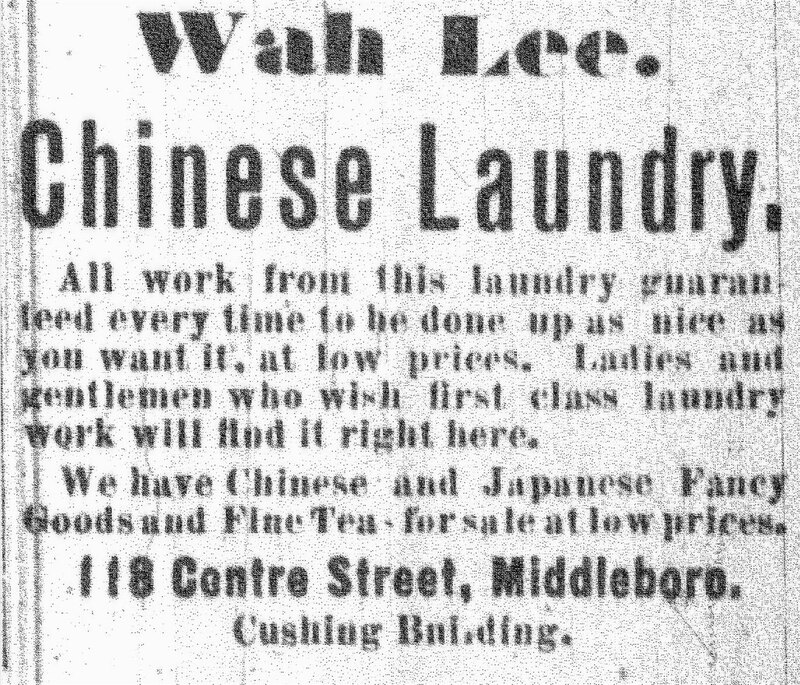 "Wah Lee Chinese Laundry", advertisement, Middleboro Gazette, October 27, 1905, p. 1. Of all Middleborough's Chinese laundrymen, Lee was the best remembered and his business was the longest lived operating for over thirty years. Originally conducting business in the Cushing Block on Center Street, Lee relocated to North Main Street in his final years. Cushing Block, photograph, early 20th century. Wah Lee's laundry occupied the southernmost of the two ground floor stores in the Cushing Block. Lee's sign bearing the simple word "LAUNDRY" is barely discernible at the far left of the photograph. 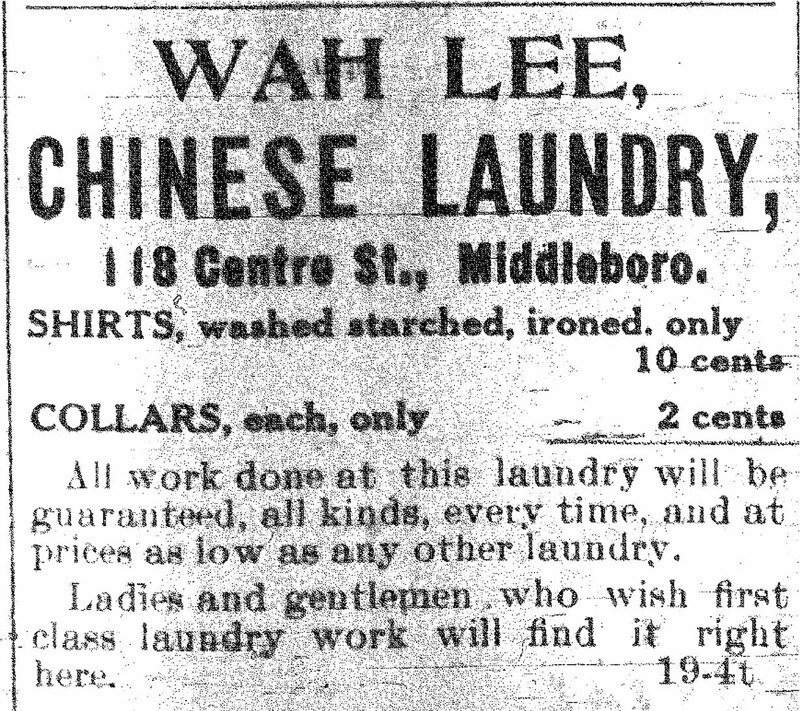 "Wah Lee Chinese Laundry", advertisement, Middleboro Gazette, May 10, 1912, p. 8. In addition to laundering, Lee acted as a purveyor of Chinese culture locally, retailing Chinese fancy goods, teas and firecrackers. Low Hen Laundry Building, 2 Thatcher's Row, Middleborough, MA, photograph by Mike Maddigan, August, 2009. Originally occupied by a tobacconist's shop, this building was the location of the Chinese laundry operated by Soo Wok and later Low Hen until 1915. The building later had a succession of occupants including the Middleborough Water Department and later Rainbows on the Row restaurant. Wing Chong Laundry, Heritage Park, Calgary, AB, Canada, photograph by oscailte, September 20, 2009, republished under a Creative Commons license. This recreation of a Chinese laundryman's living quarters in 1906 gives a good idea of what conditions were like for immigrant Chinese at the turn of the last century. 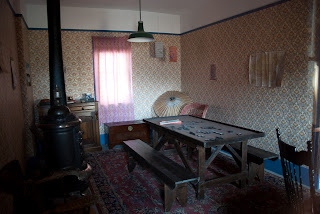 Middleborough's Chinese laundrymen typically lived at the laundries in small rooms such as this, surrounded by a few personal possessions and makeshift furniture. "The Chinese Question Again", The Wasp, volume 23, July-December, 1889. This cartoon depicts what many, particularly in the western United States, regarded as an especially vexing problem - Chinese immigration. Here Uncle Sam is no match for the wave of Chinese immigrants who swarm into the country, despite barriers such as the various Exclusion Acts which effectively barred immigration from China. With fewer Chinese, eastern communities like Middleborough for the most part remained relatively untroubled by the issue, though local Chinese were still affected by immigration restrictions. "New Laundry", advertisement, Middleboro Gazette, November 4, 1921, p. 5. 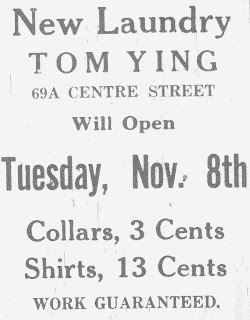 A relative new comer to the Chinese laundry business, Tom Ying established a laundry in the Pasztor & Klar Building on Center Street. Ying's laundry was short-lived and this advertisement appears to be one of the few records of its existence. 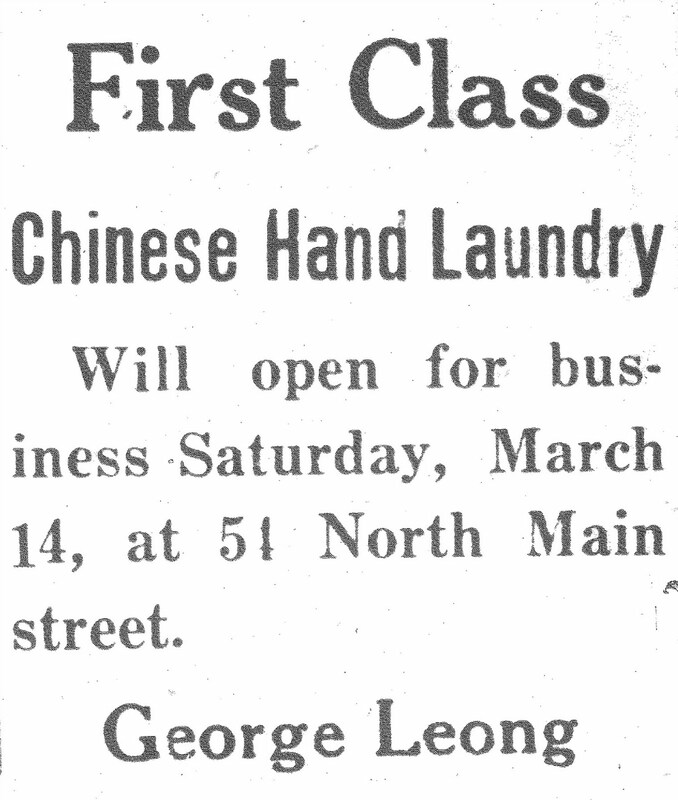 "First Class Chinese Hand Laundry", advertisement, Middleboro Gazette, March 13, 1925, p. 10. The opening of a new Chinese laundry by George Leong of Boston on North Main Street in 1925, though welcomed by non-Chinese residents, was allegedly targeted by associates of the Wah Lee laundry which objected to the competition. Though the conflict beween the two laundries was rather melodramatically depicted as the start of a potential local tong war by the Middleboro Gazette, in reality it was an unfortunate conflict between two businesses caught in a changing and shrinking market. "Wah Kee Hand Laundry", advertisement, Middleboro Gazette, January 8, 1937, p. 12. Wah Kee's was one of the last Chinese laundries to operate in Middleborough. 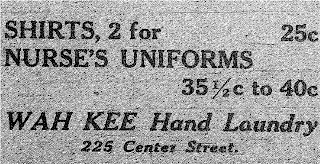 With the falling out of fashion of men's shirt collars and cuffs which previously constituted a sizeable portion of the laundryman's business, Kee focused his attention on other items such as uniforms in order to solicit business. Resident and Business Directory of Middleboro and Lakeville, Mass., for 1895. (Needham, MA: A. E. Foss & Co., 1895), pp. 125, 160, 180. Resident and Business Directory of Middleboro, Massachusetts for 1897. (Needham, MA: A. E. Foss & Co., 1897), pp. 86, 119. Resident and Business Directory of Middleboro’ and Lakeville, Massachusetts for 1899. (Needham, MA: A. E. Foss & Co., 1899), pp. 85, 143. 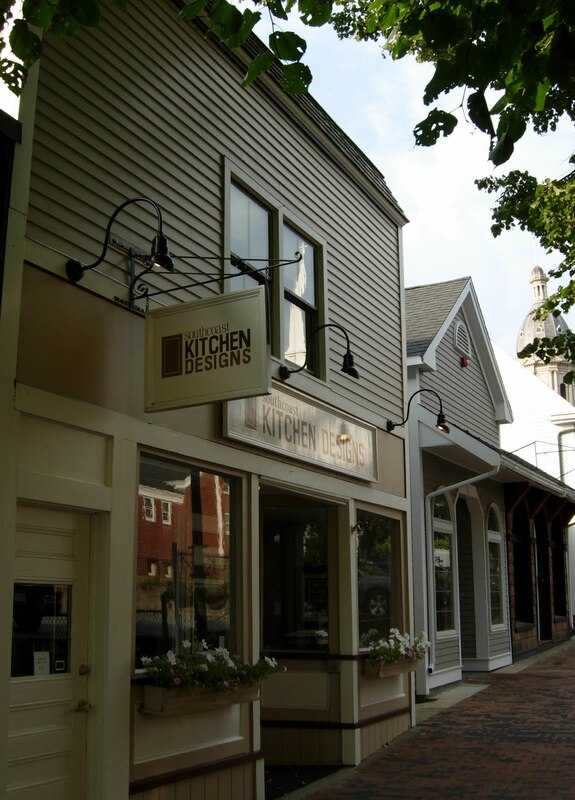 Resident and Business Directory of Middleboro, Mass. 1901. (No. Cambridge, MA: Edward A. Jones, 1901), p. 130. Resident and Business Directory of Middleboro and Lakeville, Mass. 1904-5. (Boston, MA: Edward A. Jones, 1904), p. 126. Resident and Business Directory of Middleboro, Mass. 1906-07. (Boston: Boston Suburban Book Company, 1906). Resident and Business Directory of Middleboro and Lakeville, Massachusetts. 1909. (Boston, MA: Boston Suburban Book Company, 1908), p. 130. Resident and Business Directory of Middleboro, Massachusetts. 1913. (Boston, MA: Union Publishing Co., 1913), p. 132. Resident and Business Directory of Middleboro, Massachusetts. 1914-15. (Boston, MA: Union Publishing Co., 1914), p. 133. Resident and Business Directory of Middleboro, Massachusetts. 1921-23. (Boston, MA: Union Publishing Company [Inc.]), p. 116. Crosby’s Middleboro, Massachusetts Directory. (Wollaston, MA: Crosby Publishing Company, 1928), pp. 117, 193. Middleboro and Carver, Massachusetts, Directory. North Hampton, NH: Crosby Publishing Co., Inc., 1934), pp. 29, 31. Middleboro. New York, NY: Sanborn Map & Publishing Co. Limited. August, 1885. Middleboro, Plymouth County, Mass. New York, NY: Sanborn-Peris Map Co., Limited. May, 1891. Middleboro, Plymouth County, Mass. New York, NY: Sanborn-Peris Map Co., Limited. June, 1896. Middleboro, Plymouth County, Mass. New York, NY: Sanborn-Peris Map Co., Limited. April, 1901. Insurance Maps of Middleboro Plymouth County Massachusetts. New York, NY: Sanborn Map Company. March, 1906. Insurance Maps of Middleboro Plymouth County Massachusetts. New York, NY: Sanborn Map Company. January, 1912. Middleboro Including Waterville, Rock, Lakeville and North Middleboro, Plymouth County, Massachusetts. New York, NY: Sanborn Map Company. January, 1925. Middleboro Including Waterville, Rock, Lakeville and North Middleboro, Plymouth County, Massachusetts: New Report September 1932. New York, NY: Sanborn Map Company. September, 1932. Twelfth Census of the United States, Middleborough, Plymouth County, MA. Washington, D. C.: National Archives and Records Administration, 1900. Thirteenth Census of the United States, Middleborough, Plymouth County, MA. Washington, D. C.: National Archives and Records Administration, 1910. Fourteenth Census of the United States, Middleborough, Plymouth County, MA. Washington, D. C.: National Archives and Records Administration, 1920. Thank you for the rich history lesson. I hope it stays alive and is spread among the people who live there now. Thanks for a thorough and accurate description of the conditions that led most early Chinese immigrants to enter the laundry business and for your detailed history of Middleborough’s Chinese laundries.